The Smiles by Glenos team knows that oral hygiene is important, whether you have braces on your teeth or not. But if you are a person who wears braces, caring for your teeth and gums can become somewhat challenging. Without daily oral hygiene practices, you may become prone to cavities and tooth decay during your time in braces. Naturally, you know that brushing your teeth each morning and night, as well as after you eat, will help keep your mouth healthy and clean during the months you wear braces. But flossing is also an important part of your hygiene routine. 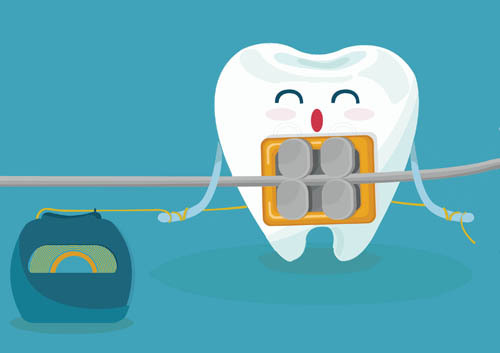 Flossing with braces can be tricky, but it’s not impossible. Dr. Jimmy Glenos, your general dentist, or your dental hygienist can help you become more comfortable and adept at flossing your teeth during the months you wear braces. Good oral hygiene habits you use while wearing braces will help you achieve the beautiful smile you and the Smiles by Glenos team have been working toward. Once your braces are off, it may be tempting to slack off on the brushing and flossing. Don’t let yourself fall into any habits that will have a negative impact on your oral health or the attractive smile you waited for throughout the months you wore braces. See your general dentist for regular cleanings, and continue to brush and floss your teeth each day.